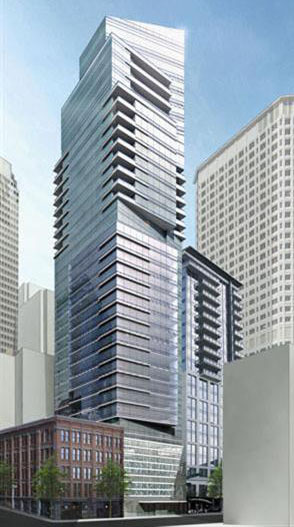 The Candela Hotel and Residences (renderings above) at 2nd and Pike is in the design review process, but just a block and a half to the north, the 1 Hotel and Residences has only made it as far as a bare hole in the ground dug in 2007. Intracorp is selling off its 24-story residential project at 1915 2nd Ave, while practically next door at 1931 and 2015 2nd Ave the Justin Company’s pair of proposed 400-foot residential towers is moving ahead. 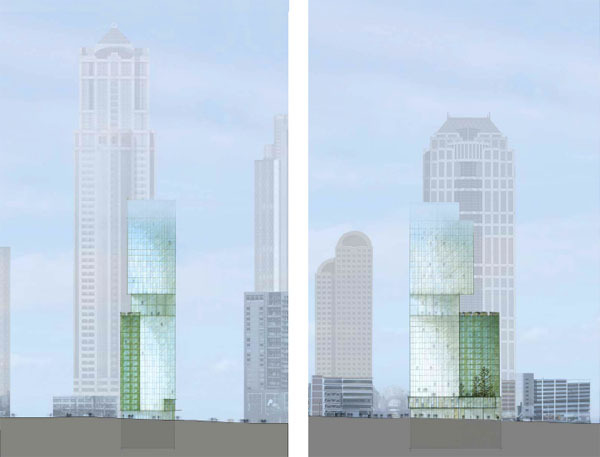 One block east on Virginia, Tarragon’s proposed 43-story apartment tower began the design review process back in 2005, but appears to be in purgatory. And two more blocks east on 5th Ave, the twin-tower, 43-story Heron Pagoda was put on hold this summer. 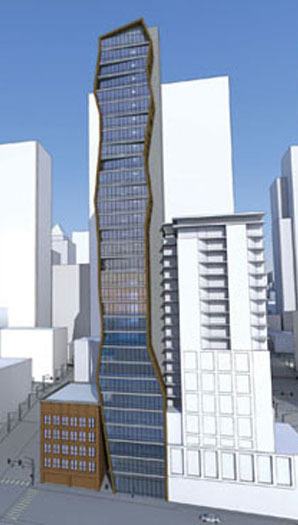 Up in the Denny Regrade area HAL Real Estate Investments recently proposed a 400-foot apartment tower at 2116 4th Ave, which happens to be right around the corner from The Martin, Vulcan’s proposed 24-story condo tower that has been languishing since 2006. And last but not least, way out on the manic end of the spectrum: the recently proposed 35-story condo/hotel project at 1012 1st Ave has units offered for sale before permits have been applied for, and conceptual designs have been produced by two architecture firms (see below) even though neither concept could likely be built because it is too close to the Hotel 1000 building to the south. Posted by dan bertolet on	Wednesday, September 17th, 2008 at 12:46 am. You can follow any responses to this entry through the RSS 2.0 feed. You can leave a response, or trackback from your own site. « How Many Differences Can You Spot? I know that zoning laws are partly to blame for this, as well as supply and demand, but it seems absurd to me that hotels in seattle are so thickly concentrated in the downtown area. Hotels are nice for visitors, but they aren’t very useful for city inhabitants. The more downtown is packed with high rise hotels, the less reason I have to go downtown. On the other hand, some of the smaller businesses up in my neighborhood would probably love to have the tourist-traffic that hotels would bring. Either way, I think the design of the hotels in these pictures are rather impressive. Yeah, I can’t really think of any on Capitol Hill which does seem strange. There’s a Silver Cloud by Seattle U. There are a couple decent small hotels in the U-District, plus Hotel Deca and the Watertown. My favorite is the College Inn, which is a beautiful historic building. Is there retail at the base or is it just going to be a lobby? I’m usually a big fan of PB elemental, but that just looks too much like hanky the christmas poo for me to take seriously. Re the PB E pic: for everyone who ever wondered what happened to the AT&T tower’s foreskin, now we know. Or, it came in a big box and someone just ripped it open and left it. Hi all, i know how it is to have a problem like this. I’ve struggling from this like a few years with the normal ups and downs so i really know to have a problem like this. At a website i found out some people were truly satisfied about a pill they purchased from the net and i also ordered it when i found those pills at – herbalhealingstore dot com -. So you see, those herbals do work, you only have to get the good ones! I seriously don’t believe it. I hope Wayne Rooney is ok for the cup! In my personal estimation, wayne rooney is without a doubt the foremost footballer within the world, and i can’t wait to see him earn the golden boot for the most goals obtained in this world cup.